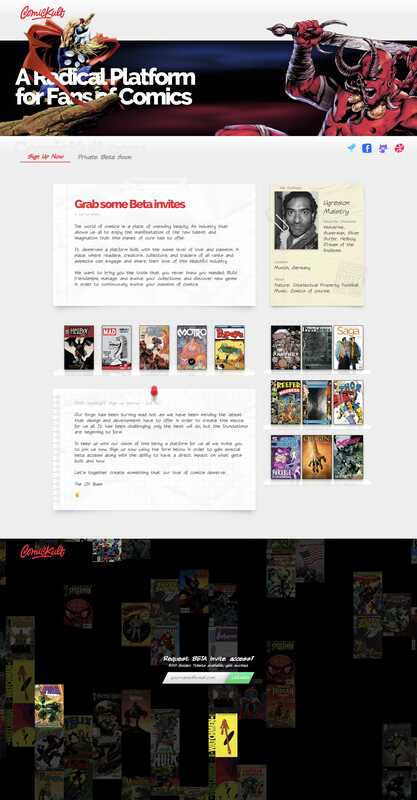 What a spectacular first impression in this (updated) launching soon page for upcoming comic portal, ComicKult. The One Pager features an incredible intro animation, highly detailed paper textures, comic shelves that change angle as you scroll and a beautifully unique tiled footer animation where you sign up for the launch notification. Final shout out to the vintage newspaper design for the mobile screen adaption. To keep up with our vision of this being a platform for us all we invite you to join us now. Sign up now using the form below in order to gain special beta access along with the ability to have a direct impact on what gets built and how. Let’s together create something that our love of comics deserve.